Pushups are one of the most basic exercises that are beneficial to build a strong core and upper body. Learn which muscles pushups work here. Push-ups are basic strength-building total body exercises that strengthen the upper body and improve the core strength. Several muscle groups in the chest, arms, shoulder, triceps, back, and neck work simultaneously during a push-up. Push-ups are performed in a prone position, which can help develop a good posture. Military personnel and athletes do push-ups as part of exercise regimen that helps strengthen the upper back and shoulder while providing stability to the torso, and promote muscle endurance and overall fitness. Pectoralis Major. These are the two large chest muscles primarily the pushing muscles of the upper body. It makes up most of the upper body. As you raise and lower your body during a push-up, the pectoralis major is doing most of the work to raise and lower your body. Deltoids. These are the shoulder muscles helping the pectoralis major to push the body during a push-up. Although they are a weaker muscle group, they are crucial to all movements of the shoulder. The rounded shoulder look is due to a well-defined deltoid. Triceps Brachii. Triceps are situated at the back of the upper arm and help in extending the arm outward. It makes up about two-thirds of the upper arm mass and is most exerted muscle during push-ups. Serratus Anterior. The serratus anterior lies under the armpit at the back of the chest. The muscles give the scapula a winged look. These muscles are activated during a push-up and doing regular push-ups strengthens the serratus anterior muscle helping in smooth movements during exercises. Coracobrachialis. The coracobrachialis runs from the shoulder blade to the upper arms. 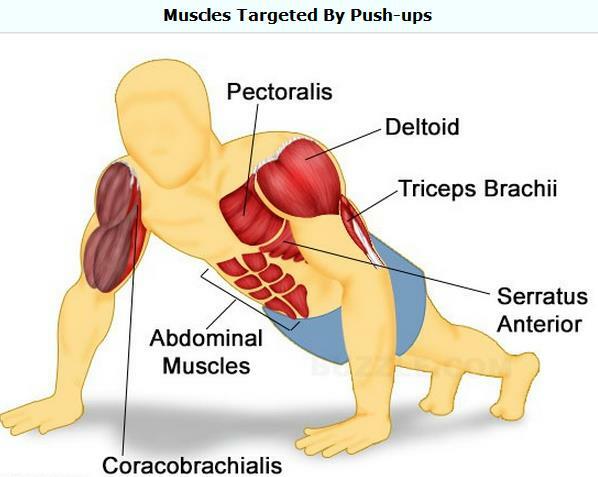 During a push-up, the coracobrachialis pushes the upper arm against the body, which is essential to perform a push-up. A well-developed coracobrachialis muscle is necessary for building upper body strength. Abdominal Muscles. The core strength develops as the abdominal muscles are engaged in a push-up. As the body is held in a prone position, the abdominal muscles help the body brace itself. Lower your body down on to the floor or a carpeted floor with your palms under your shoulders - slightly wider than shoulder width. Keep your feet close together and dig your toes into the floor helping to stabilize the lower part of your body. Maintain your body flat likes a plant by engaging your abdominals. By focusing your eyes about two to three feet in front of you, begin to lower your body keeping your back flat until your chest is nearly touching the floor. It is important that the body remain flat in a straight line throughout the lowering movement. This plank-like position is the beginning and end position during a push-up. Keep the elbows close to the body, and draw the shoulder blades back and down. Keep your head facing forward and inhale as you lower yourself. Exhale as you push to the start position without leaving the ground. The chest and shoulders provide the strength for the push-up. Continue to push up until your arms are almost straightened. Repeat the above steps after pausing for a few seconds. Adhere to proper stretching and cool-down routines are necessary. The wider your arms, the better it is for you to execute a successful push-up. If you are a beginner, do a slow and proper push-up and do not rush to simply finish off the push-up. You can begin by balancing on your knees instead of your toes if you find it easier. Then you can begin to balance on your toes when you feel confident and relaxed. Try not to lower your hips during a push-up. If your lower back begins to hurt during a push-up, stop and take a break. Wide Grip Push-ups. This classis push-up is more difficult than the standard push-up as it provides less mechanical advantage to push your body upward. The wide grip push-up targets the chest, triceps, and muscles in the front of the shoulder. The shoulders and chest are worked up with the assistance of the triceps. Incline Push-ups. The incline push-up is the most commonly used push-up targeting different parts of the chest. The triceps, deltoids, and core muscles are activated during incline push-ups, with lesser stress on the elbows reducing the amount of body weight being lifted. Incline push-ups activate the chest muscles and prevent sagging of the spinal column. With a slow motion, the core is engaged and the incline push-up can be used as a pre- or post-exercise stretch. Decline Push-up. A decline push-up is an advanced upper body exercise targeting the chest, shoulders, arms, and back. By placing the feet higher than the hands, the level of difficulty can be significantly increased because maintaining proper rigid body position requires significant strength and stability in the core, legs, and back. One-Arm Push-up. A one-arm push-up strengthens the chest and triceps muscles and builds a strong and muscular core. The abdominal muscles and obliques have to work extra hard to keep the body stabilized on one arm and you must have sufficient strength to maintain the position. Building muscle and strength is important for total body control during a one-arm push-up. T Push-up. The T push-up is a variation of the standard push-up. More muscle groups are involved during a T push-up. The T push-up requires the muscles to work much harder to balance the body during the exercise. It works the core muscles, chest, and shoulder at the same time, which does not happen often.